Schedules and routines play an important role both at home and in the classroom, helping children prepare and feel comfortable with transitions throughout the day. At TLC, we follow the Pyramid Plus teaching model, which utilizes different methods to communicate and engage children in smooth transitions from activity to activity. One tool TLC teachers use to aid transitions is visual cards. Visual cards have pictures depicting what the class will be doing throughout the day. The cards help children be aware of and prepare for what is going to happen next in their classroom schedule. Children also have the opportunity to make decisions regarding what activities will be part of the routine, and when the activities will happen. Cards are often Velcroed to a yard stick, and children can rearrange them with the teacher's help and consent. Each class has a daily Schedule Helper. When having group time, the day's Schedule Helper communicates to the other children what has happened, and what is going to happen next, preparing his or her fellow classmates for successful transitions through out the day while working on verbal skills and public speaking. Using these same techniques can be helpful with home routines, too. Routines like getting ready for school, getting ready for bed, or trips to the grocery store can all be pre-planned using visual cards or similar tools, so a child is better prepared to transition from activity to activity and place to place. My daughter, Shea, decorated the file folder on the outside and helped plan and create her schedule, which allowed her to engage in the process and have buy-in to the routine. Having your child help can give him or her a sense of ownership, and can build excitement about schedule. To make the schedule, place the Velcro on the back of the visual cards and then in the file on the left side. Then, take one side of the Velcro and place it on the other side of the envelope so when your child finishes that part of the schedule they take the card and move it to the other side. When using this tool, the child is part of the process of choosing and completing tasks, and can feel a sense of accomplishment at seeing what tasks they have completed. To further break down the routine into manageable parts for younger children or children with developmental delays, you can also take pictures of the different stages of the routine (for example, squeezing toothpaste onto the toothbrush as a step). The schedule is fully personalizable to your child's needs. Allowing your child to know and see what is going to be happening throughout their day helps them prepare and feel comfortable through transitions. 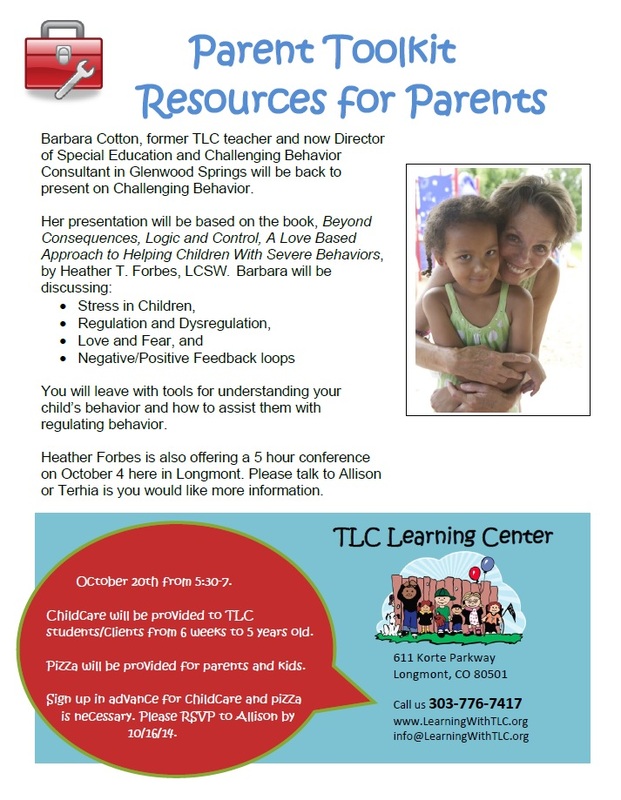 Are you a TLC parent who wants to learn more about positive behavior reinforcement at home? Come to TLC's Parent Toolkit Night on October 20th! Transitions can be hard… for all of us. This is something I am acutely aware of during this current season we like to call “back to school.” As a mom and an Occupational Therapist, I regularly see the challenges associated with transition periods in kids (and sometimes, grown-ups too). These can range from the transition of going from kindergarten into 1st grade, to transitioning between play activities, to transitioning from just getting out of the house and into the car. Personally, I see the flurry of disorganization and dole out hundreds of reminders trying to get my own crew out the door in the morning (do I really need to remind a 12 year old to brush her teeth?). Professionally, I often see families with children who are unable to seamlessly transition from activity to activity. The following strategies are a few ways that may help with difficult transition times, and will hopefully help with increasing independence as well! 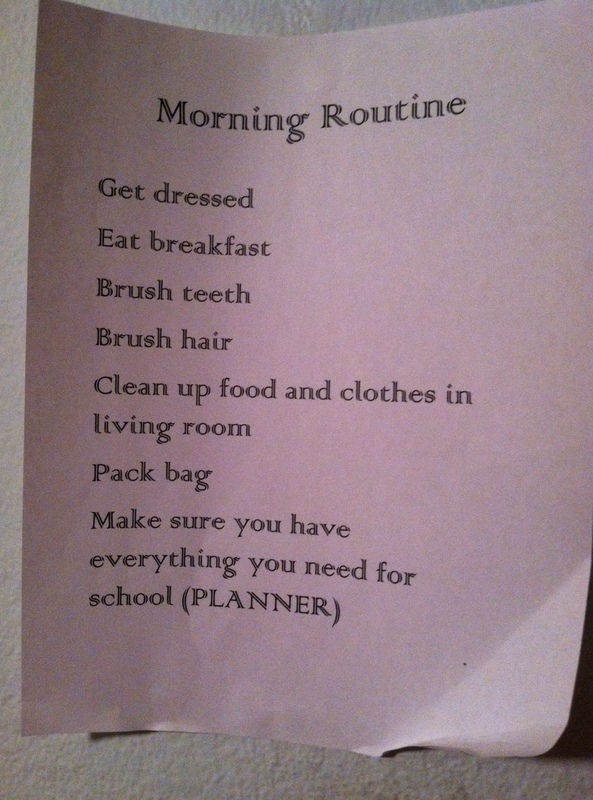 Children crave routine and structure! It helps them feel safe and understand what will be happening next, or what to expect. For example, a bedtime routine could be: jammies on, brush teeth, one book, then bed. If bedtime always looks the same, it can increase the child’s independence in completing the steps themselves, and decrease struggles with caretakers. Kiddos also respond well to visual schedules. At TLC, we use pictures to show the kids what the day will look like. The pictures are arranged in order of when parts of the day happen (circle time, snack, outside, free play). If the day will look different from a typical day for any reason, the change is noted in the schedule. A child I see at TLC was very anxious about what he would be doing during our sessions. He would ask questions repeatedly and become very upset if there was something in the room that was unfamiliar to him when he walked in. We have a routine now, of sitting together first thing and drawing our schedule on the board. It allows him to understand what his time with me will look like, gives him some control of the activities, and keeps him organized as we mark off the activities that we have completed together. His anxiety has lessened significantly throughout his time coming to TLC, and now he is much more able to try novel things. Schedules can be as specific or as general as you need. Some kiddos benefit from a personal schedule that they keep with them, while others can check in with a general schedule to help keep them organized and knowledgeable throughout the day. At home, you can experiment with something as simple as a white board that allows you to draw pictures or write words depending on what is appropriate or works for your child. It can be specific like the morning routine, or it can be more broad, as in what will happen that next day, or week (or both!). Transitioning between activities can be challenging, too. Giving a consistent visual cue (turning off or dimming the lights), giving a “2 minute” warning or singing a transition song, can help prepare the child for change. These transition songs are nothing complex. Mine often consist of a silly song about what we are completing and what will be next and is regularly sung to the tune of “Twinkle Twinkle Little Star” or “BINGO”. We all benefit from the comfort of predictability. For our kiddos, providing routines and schedules not only helps with some of the struggles related to transitions and change, but helps them develop a sense of security and control, and supports increased confidence and independence. This is what we all want for all our kids. To learn more about how working with an Occupational Therapist may help your child, or to learn about how our classrooms help build independence in children, contact TLC at (303)776-7417.